The Ansel Adams Wilderness encompasses 231,066 acres, including most of the famous John Muir Trail. The June Lake loop is at the border of the Wilderness area, which extends along the northwestern Sierra Nevada Range from Yosemite National Park in the north, to the John Muir Wilderness Area in the south. 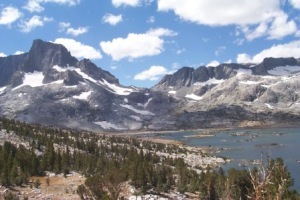 The Ansel Adams Wilderness was established in 1964 as a part of the original Wilderness Act, and was originally named the "Minarets Wilderness." After the death of the famous photographer in 1984, the wilderness area was expanded and re-named. Some of the important points of interest in the Ansel Adams Wilderness lie along the sierra's Ritter Range, including the Minarets, Mt. Ritter and Banner Peak. Banner Peak, shown with Thousand Island Lake in the photo on the left, is also visible from the June Lake Junction just behind and to the right of our local landmark Carson Peak. The Rush Creek Trail begins near Silver Lake, and it intersects the John Muir and Pacific Crest Trails near upper Rush Meadows. A few of the many other hiking destinations within the Ansel Adams Wilderness that are convenient to the June Lake Loop by trail are Parker Lake, the Mono Pass area (above Bloody Canyon), Fern Lake, Clark Lakes, Gem Lake and Alger Lakes.